Gift cards make a perfect gift for any special occasion. 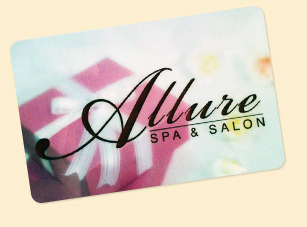 Allure Salon & Spa’s gift cards are available in any denomination and are good for up to one year past the point of purchase. Gift cards are non-refundable and cannot be traded in for cash value. Please contact us online or call 330.729.3000 to find out more!